Maria Sharapova, Arthur Ashe, Bjorn Borg, Billie Jean King, Rafael Nadal, Roger Federer and Serena Williams – the list of tennis greats is never-ending. With tennis Grand Slam tournaments such as Wimbledon, French Open, Australian Open and the US Open happening all around the year, these players along with many others get the chance to show their mettle to the world. And tennis fans watch, enthusiastically cheering on their favorites. Tennis tickets, especially for these prestigious events, sell out fast. With the Australian Open right around the corner in January 2018, your favorite players are gearing up to give the performance of their lives. With Rafael Nadal leading the Men’s Tennis ATP Rankings in 2017, with 10645 points, and Roger Federer only a short distance away from the top spot with 9605 points, the upcoming tennis tournaments in 2018 would surely provide a lot of nail biting competition moments! Let’s have a look at the major Grand Slams and everything you need to know about them. Grand Slam tournaments are the four most important tennis events in the year. These tournaments offer the most in terms of ranking points, public and media attention, prize money, strength and size of the field and the number of “best of” sets for men. The Grand Slam tournaments kick off with the Australian Open in mid January, followed by the French Open in May/June, the prestigious Wimbledon in July and the US Open in August and September. Australian Open: The Australian Open was founded in 1905 and has been played in Melbourne since 1972. It has been played on hard courts since 1988, before which it was played on grass. The tournament typically has very high attendance records, often surpassing the US Open. It also holds the record for the highest attendance at a Grand Slam event. The entire event is broadcast internationally via sports channels and multiple online channels. The current champion for the Men’s Singles in 2017 is Roger Federer, winning his 5th Australian Open title. Serena Williams was the winner of the Women’s Singles in 2017, making it her seventh victory at the Australian Open. French Open: Also known as Roland-Garros, the French Open was founded in 1891 and is played in Paris. It has been played on clay since 1908, before which it was played on sand. The French Open is considered to be one of the most physically demanding tennis tournaments in the world, because of the seven rounds needed for a championship and the slow-playing surface. The current champion of the French Open 2017 for Men’s Singles is Rafael Nadal. It was Nadal’s tenth title at Roland Garros and fifteenth Grand Slam singles title. Jelena Ostapenko was the winner of the 2017 Women’s Singles, landing her first ever Grand Slam title. Wimbledon: This is the oldest and the most prestigious tennis tournament in the world, founded in 1877 and held in Wimbledon, London. The tournament is played on outdoor grass courts and is the only major of its sort. It consists of five main events and four junior events, along with seven invitation events. Another defining factor of the Wimbledon matches is the all-white uniforms that the players are required to wear for all games. Roger Federer was the winner of the Gentlemen’s Singles in 2017, making this his eighth Wimbledon title win. Garbiñe Muguruza won the Ladies’ Singles for the first time in her career. US Open: The US Open is the last Grand Slam tournament of the year that kicks off on the last Monday of August and goes on for two weeks. The tournament was founded in 1881 and is played on hard courts. The prize money for the 2017 edition of the tennis tournament was $50,400,000 won by none other than Rafael Nadal – who bagged his third US Open title. Sloane Stephens won the Women’s Singles in 2017 – it was her first Grand Slam title. Rafael Nadal: The Spanish national is currently ranked the world No. 1 in men’s singles. Commonly referred to as “The King of Clay”, Nadal has won a total of 16 Grand Slam singles titles. He is the second male player, after the legendary Andre Agassi, to have completed the singles Career Golden Slam. Roger Federer: The Swiss tennis player currently ranks at No. 2 in men’s singles, with 19 Grand Slam titles. He has won eight Wimbledon titles, five consecutive US Open titles, five Australian Open titles and one French Open title. Federer was named the Swiss Sports Personality of the Year six times and has also won the ESPY Award for Best International Athlete. Grigor Dimitrov: The Bulgarian born professional tennis player stands at No. 3 on the current world rankings, a position he achieved in November 2017. Dimitrov is the only Bulgarian tennis player to have reached the top 10 in the ATP Singles ranking. Alexander Zverev: The 20-year old from Germany is the son of former Russian tennis player of the same name. He entered the ATP top-10 for the first time in May 2017 after defeating Novak Djokovic in the 2017 Italian Open Finals. He also defeated Roger Federer at the 2017 Canada Masters and reached the ranking of World No. 3, before dropping to No. 4. Dominic Thiem: The Austrian professional tennis player reached the ranking of world No. 4 on 6th November 2017, before eventually dropping to the fifth spot. The 24-year old has won eight singles titles on the ATP Tour and is showing great form for future tournaments. Other big names that landed on the ATP Rankings include Jack Sock at No. 8, Novak Djokovic at No. 12, Sam Querry at No. 13 and John Isner at No. 17, among others. The next year of tournaments promises to offer numerous nail biting competitions between some of the greatest players. Cheap tennis tickets are now available for some of the tournaments coming up in 2018. 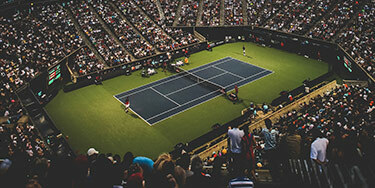 Whether it is matches between legends like Nadal and Federer or between the numerous upcoming tennis greats, you wouldn’t want to miss the latest tennis matches. So, grab your tennis tickets at the earliest and get ready to hit the courts!